Traditional societies built their city-the symbol of their culture-as an image of the cosmic order. The city of earth is an imitation of the city of heaven, and its structure is taken from the eternal archetype. The plane of the city of human beings must be a tracing of the numbers and measures that rule the universe, and a ritual manifestation of the divine plan executed by the gods. The city and the entire culture bear witness to this attitude and this Knowledge expressed through the laws of analogy or of inverse correspondence. In this fashion they establish a communication with the heavenly, a bond between earth and heaven, between a known plane and another, unknown plane, between visible beings and the energies of the invisible numina. In the symbolism of the Christian temple, this place of encounter and realization is represented by the sanctuary-the Hebrew sancta sanctorum-and the mountain and the sacred cave are generally assimilated to the temple and the tabernacle (or the crypt) respectively. The Egyptians, who also built sacred pyramids, situated within them a series of spaces or habitations-authentically funereal-in which the rites of initiation were performed. Thus, the house of worship is fundamentally the space or place where initiation to knowledge is produced. It is in function of a central axis which establishes the heaven/earth (and underground world, as well) linkage, that the life of a culture is realized.3 And the same is applicable to man, who, after all, as the microcosm, is a temple made to the image and likeness of the macrocosm (the divine temple and house of God), and the plan and laws that have founded each have been analogous. In the case of the principal temple of Tenochtitlan, heart of the Aztec people, the magical-theurgical symbolism is evident. The temples and buildings that characterized this sacred citadel were erected in the exact place where the ancient Mexicans had once received the signs, the divine tokens, that ordered them to settle there after so many years of arduous pilgrimage. This is a clear instance-like that of the Incas in Cuzco, and others, historically demonstrated in the Precolumbian area-of how a culture is established and radiates outward in the constant migrations of the human species, as well as of the manner in which their symbolical structures can be transferred to individual man. Of course, the latter must be able, at a given moment of his life, through the use of his own signs and tokens, to establish a direct linkage with other worlds-with different planes that integrate a single unique reality, realized by means of the gradually more subtle and impalpable manifestations of these planes. This is equivalent to the experience of secret stages of Universal Being, and to the knowledge of a cosmogony, symbolized, in this case, by the pyramid, with its rectangular base and the various levels to be scaled, by stages, towards the summit. If we project the volumetric figure of the pyramid onto a plane, we shall obtain a small central square, and another series of squares surrounding it-in a series numerically equal to the pyramidal steps-from the interior to the exterior, from the center to the periphery, from the merely virtual to the limit of its own manifestation. Here we have the symbol of the possibility of a return to that mysterious, impassible virtuality, through the intermediary of the pyramidal temple with its steps, from the base to the central or axial culmination. This maps an inverse route, if we consider it in terms of the perspective of man, who has built the earthly temple, vis-à-vis that of the Universal Architect, who has created the celestial plane from out of his Unity into the multiplicity of his expressions. While man-one of those expressions-must go from manifestation to immanifestation, from the created to the uncreated, from the human to the superhuman or divine. This is a return to the origins, to the source, to the invisible that is ever revealed in works. We have referred to these matters in another work.4 Here we shall only indicate that the temple or center of worship5 joins the vertical energies with the horizontal, seizing successive, fleeting time in sacred space, that receptacle of the divine energies or vibrations, of the eternal. Thereupon it diffuses them on the plane of earth, in the horizontality of the social community, which is organized in conformity with its proximity or distance to the temple, symbol of receptivity, revelation, and sacred wisdom. The temple is the living image of the cosmos, the conjunction and complementarity of earth and heaven, such as we have in the case of the pyramid, by way of the square of the base (earth) and the triangle of the sides (heavens). In some traditional societies, this heaven is represented by a circle or semicircle, which, in tridimensionality, is the dome or cupola crowning the square of the base of the edifice. In other traditions, such as the Greek (as likewise in certain Roman and Christian structures), it is also the triangular form in alternation with the circular that we find over doors, monuments, and altars. Here the triangle and the circle or semicircle are equivalent, and are used indistinctly as figures of heaven,6 in contrast with the quadrangle of earth, even though both form a harmonious whole-a single construction comparable to the entire cosmos. This is particularly evident in the case of the sun, the moon, and especially Venus, along with the deities associated with these stars. Among the latter, the principal exponent is Quetzalcoatl, perhaps the most important god of the American pantheon, known by various names in the various languages and customs of the peoples who knew and venerated him, as we have said. The same occurs with the earth, which dies in winter and is born with the spring and the rains. Again, we have the life and habits of certain animals, which for this reason-that they are sharers in the dialectic of the deity-are sacred. Such is the case with the humming bird, who hibernates for months, and indeed seems dead, but at last is reborn in all of its beauty, gladness, and splendor. Then there is the salmon, among the North American and Canadian tribes of the Northwest, which, with the arrival of a certain time of the year, migrates to the sea, to ply the rivers once more, against the current, and spawn in its original place, completing an entire cycle of life/death/life symbolizing this "eternal return." Likewise we have the butterfly, which undergoes the transformation from the earthly to the volatile, and is born in spring, the season of the rains and generation, along with the flowers. All of this is immediately akin to the laws of the construction of the cosmos-temple and city par excellence-and the permanent execution of the divine plan. That plan includes a constant vital regeneration, intimately associated with initiation, which, through an analogous mechanism of life/death/life, establishes the authentic being, one's true name, and the incredible potential of the human, making use of the earth as a support for the unfolding and development of that potentiality. 1 Fray Diego de Landa tells us: "In the center of the population were their temples, with their beautiful squares, and all around the temples rose the homes of the lords, the priests, and the most important persons. Then came the homes of those who were held in the highest esteem, and on the outskirts of the city were found the houses of the lowest classes." 2 The tree, too, shares in this symbolism of axial passage, and therefore is called the tree of life. In the Mayan cultures, certain mythical personages climb its trunk and, transformed into other beings, are lost in the heaven of its foliage. 3 Certain traditions divide vertical space into three levels, which they denominate heaven, earth, and atmosphere or intermediate world. Others call these three planes heaven, earth, and underworld. These two divisions into three worlds are equivalent and homologous, and, in the vegetal symbolism of the tree, refer to the leaves and branches, trunk, and roots. 4 Federico González, La Rueda: Una Imagen Simbólica del Cosmos (Barcelona: Symbolos, 1986). 5 In certain groups, the home itself fulfills this function. The altar is the hearth. The fire, transformed into smoke (incense), escapes by way of an opening constructed at the peak of the roof. The paterfamilias is the priest, or his wife is the priestess. 6 There are numerical reasons, as well, for this: nine is the square of three. 7 Juan de Torquemada, Monarquía Indiana, book 8, chap. 3. 8 Fernando de Alva Ixtlixochitl, Obras Históricas (Mexico City: U.N.A.M., 1977), p. 126. 9 Let us observe the correspondence here with what Dante describes in The Divine Comedy. The similarity is all the more meaningful in that the Dantesque cosmology is the Ptolemaic, Christian, and medieval, and corresponds, rather than to a geocentric view, to an anthropocentric position. M. Asín Palacios, a Catholic priest, has brought out the intimate similarity between The Divine Comedy and the Islamic cosmology as expressed by sage Ibn al-Arabi. Other critics have broadened these commentaries, relating the cosmologies just mentioned with the Hebrew cabala, and with the Iranian and Buddhist conceptions. None of these commentaries are without truth, although they come from the viewpoint of the historical influences and original sources to which, of course, Dante had no direct access. It is the same with the Precolumbian symbolism, seeing that The Divine Comedy was written nearly two centuries before the discovery of America. Actually, what these concurring conceptions manifest is the unity of traditional doctrine, the symbolic expression of the ever-present cosmogony. 10 For the cosmogony, the lords of the day were thirteen, and the lords of the night (or underworld) nine. To the nine gods of day and heaven were added the four that correspond to the cardinal points-those marked by the limits of space on the line of the horizon, or quadrangular plane of the surface of the waters that served as permanent contact between the world of light and that of darkness. In these terms, the thirteen lords of light are divided into nine of the heavens and four of the earth. Correspondingly, and inversely, the nine heavenly gods are matched by the nine of the underworld, who were separated by the quadrangular plane of the earth. 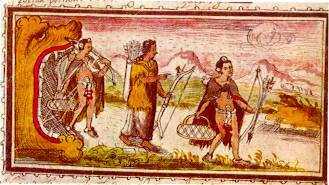 For the Nahuatls, the primitive creative pair had engendered four sons, who dwelt at the four cardinal points of Tlactípac, the surface of the earth, and had formed both the heavens, and the gods that rule the underground levels. 11 The kiva, temple and place of initiation of a great proportion of the North American cultures, has its entrance in the roof, at ground level. The roof leads below the level of the earth, to the depths of the enclosure, which are symbolic of the underworld, and have their exit the same as their entrance, but that exit is now reached in an upward, or zenith-bound course.